Rice milk is milk that is made from milled rice and water. Usually, additives and preservatives are incorporated in it to improve its consistency and lengthen its shelf-life. 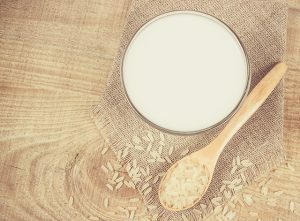 Rice milk is the least likely of all milk products to cause allergies; therefore, people who are lactose-intolerant or have allergies to milk, nut, or soy can safely consume it. It is naturally sweeter than other milk alternatives. A cup of rice milk contains around 22 grams of carbohydrate, less than one g of protein, 120 calories, and two g of fat. Fortified rice milk contains calcium and vitamin D. The United States Food and Drug Administration and the American Academy of Pediatrics advise not relying on rice and rice products alone – especially pregnant women, children, and infants – for sustenance, since they contain high inorganic arsenic levels. Since it has no cholesterol content, it can be consumed by people who have dietary restrictions on fats and cholesterol. However, if you have diabetes, you are better off drinking almond, cow, or soy milk, since rice milk contains a huge amount of starch and carbohydrates. Rice milk is high in all the B-vitamins that boost metabolism, nerve, and circulation function. Rice milk is good for the cardiovascular system as it regulates blood cholesterol and blood pressure levels. It can also boost red blood cell production, which in turn contributes to better oxygenation and rejuvenation of muscles and tissues at the cellular level. Use rice milk to get the most financial bang for the do-it-yourself buck. Toasting brown rice in a dry skillet would bring in optimum results. For some fancy rice milk recipes, visit these sites. Rice milk boosts metabolism, nerve, and circulation function. Rice milk is good for the cardiovascular system as it regulates blood cholesterol and blood pressure levels.